Do You Think Nathan Drake Is "Bigger" Than Lara Croft? Well, do you? We're curious. 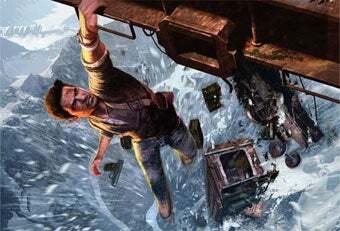 Because Naughty Dog's Bruce Straley thinks the Uncharted star already is, and is a little taken aback that you don't all think the same. Why do you think he's not already there, if not beyond that point already, in terms of popularity? I feel that Nathan Drake can stand on his own in any line up of the video game pantheon. We've created something new with him by infusing him with traits more associated with a good movie protagonist than just a video game icon. Sorry, Bruce. You haven't hit the "Lara Croft" big time until you've appeared on the cover of a precocious popular culture magazine. Or until we've seen promo shots showing Nathan with his shirt off. Or half tucked-in.